Accessorize your neighborhood’s CBU mailboxes with 13 door cluster mailboxes classic accessories by Auth Florence. 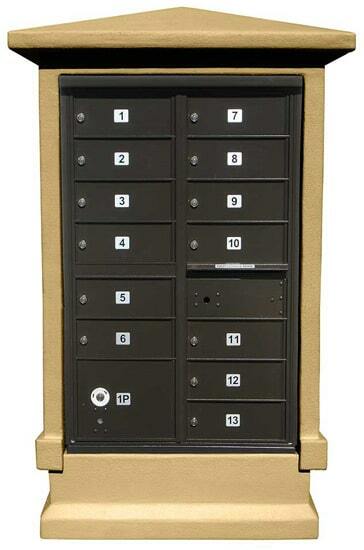 These economical and ready-to-install 13 Door CBU Mailboxes are fully approved by USPS for safe and secure centralized mail delivery and come with cap and base accessories that are very aesthetically pleasing. 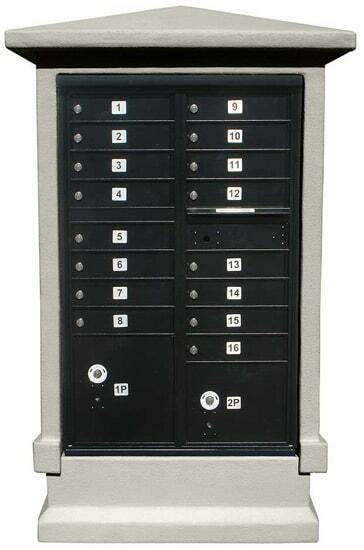 100% die cast aluminum 13 door cluster mailboxes classic accessories come ready to install and quickly snap together with self-tapping screws, without compromising USPS approved security requirements. 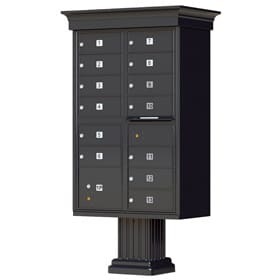 Decorative mailbox accessories include a crown moulding inspired CBU roof cap, square post column wraps and pedestal post base wrap. These versatile CBU mailboxes are available in matching architectural Auth Florence weather-resistant powder coat finishes. 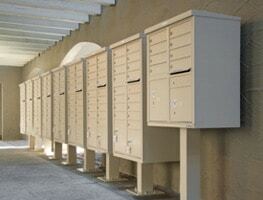 Approved by USPS in 2005, Auth Florence pedestal mounted CBU cluster box units are some of the most widely used Commercial Mailboxes in the nation for safe and secure mail delivery to one central location. 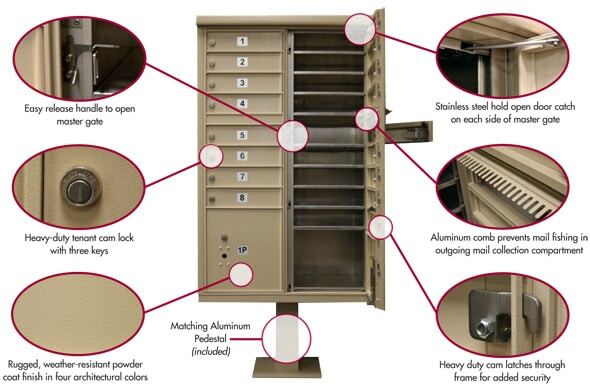 Featuring the strongest protection against mail theft plus 5-pin cylinder tenant cam locks, interlocking and overlapping seams and aluminum comb on the outgoing mail slot to prevent mail fishing. 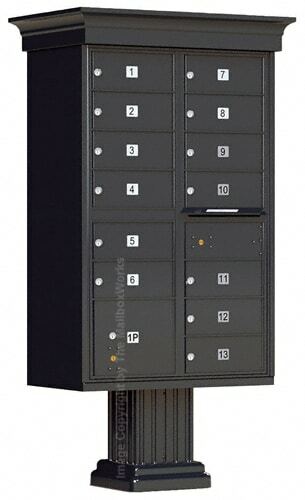 Free-standing outdoor mailbox unit includes 13 locked compartments, 2 parcel lockers and a secured outgoing mail slot prepared with a USPS Arrow Lock. 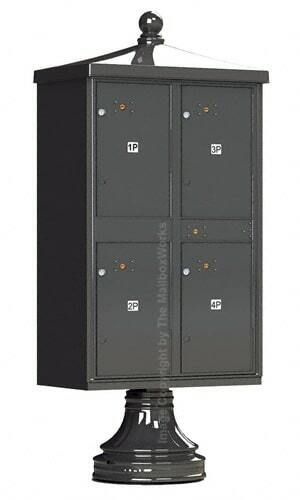 Secure construction design consists of heavy duty aluminum materials, stainless steel full wrap around hinges and welded seams in place of easily tampered rivets. 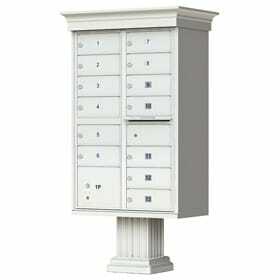 Comes with 3 keys per compartment door and silver placards for tenant door identification. Select the engraved options under “Tenant Door Identification” to the right for customized CBU mailbox tenant door identification. 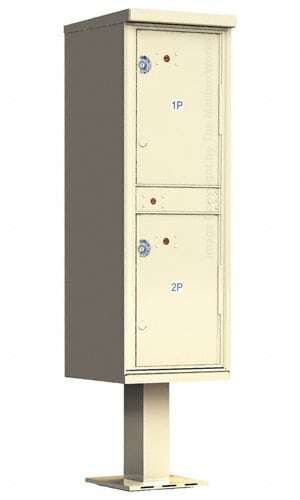 All CBU cluster mailboxes are coated with a rust-proof powder finish to withstand damage from force and severe weather. Recommended for multi-family neighborhoods, industrial use, universities, military bases, business offices and even government agencies. Ask The MailboxWorks about conversion kits for private use. 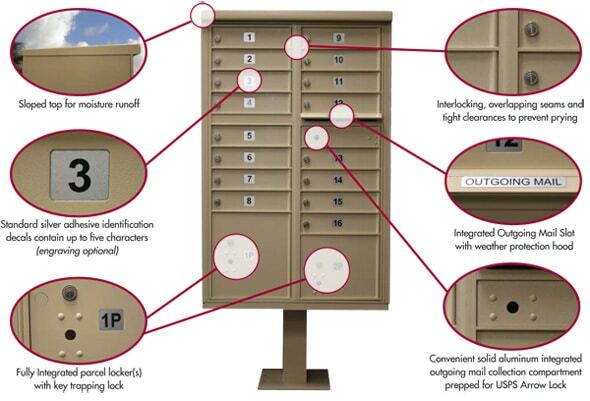 To learn more about these 13 door cluster mailboxes classic accessories or for help in purchasing CBU mailboxes online, call us or chat with a customer care rep if you have any questions.